How much exercise is required in a day? A study published in the International Journal of Behavioral Nutrition and Physical Activity states that a large percentage of Indians are inactive with fewer than 10 % engaging in recreational physical activity. According to WHO, individuals should perform at least 150 minutes of moderate to vigorous physical activity per week for maintaining good health. In India, at present, more than half of the population does not meet these recommendations. Moreover, individuals appear to get most of their physical activity from their occupational domains. When it comes to physical activity, even few minutes of it is considered better than nothing at all. A recent study states that 30 minutes of physical activity in a day can do wonders to your health. In today’s extremely fast-paced, stressful lifestyle, it is a prerequisite to maintain good health at all times. So if you feel that 30 minutes is going to be far too much of your time spent on physical activity, you can split your exercise into 10 minute sessions – 3 times a day. But ensure that you engage in intense workouts during these sessions to gain maximum benefit from these short bursts of exercise. These 10 minute sessions also ensure that we are active throughout the day and also helps keep our metabolism high. 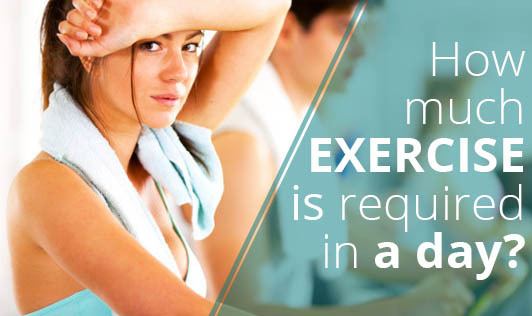 So, if you want to feel more confident, have more energy, and perhaps live longer, start exercising from today!